The Easyboot Epics are available in two options - with or without the gaiter. The photos shows it with the gaiter. The gaiter-less version just goes by the name of "Easyboot". The gaiter makes them much more secure on the hoof and less likely to fall off especially if used for turnout. If you use them without the gaiter you need to make sure you get a really tight fit. 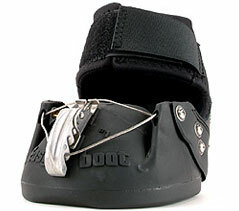 The boots tighten using a cable and buckle system which allows numerous adjustments. The gaiter fastens around the fetlock using velcro. The tread on the bottom of the boot is really durable but the sole itself is very rigid and does not conform to the sole of the hoof or to the ground surface. This means that the hoof wall then bears most of the weight which is not ideal. You can avoid this to some extent by adding a pad in the bottom of the boot but you still don't get the same stimulation as you would in a flexible-soled boot such as the Jogging Shoes. This also affects the ability of the boot (and hoof) to gain traction on uneven ground. All the parts on the boot can be replaced should they break but they are fiddly and time-consuming to replace. I used to be a big fan of these boots (before the release of the Jogging Shoes) but towards the end I was frustrated as I was having to replace both the gaiter and the wires quite often which made them an expensive boot long-term. Ideally, the width and length measurement will fit into the same boot size. If the width and length measurements indicate different boot sizes, select the larger Easyboot Epic size. If the width and length measurements are different by more than one size, EasyCare hoof boots are not recommended. The manufacturer's recommended price is $87.50-$103 (US) each. See the eBay listing to the right for cheaper deals.